"Advancing Higher Education as a Field of Study" by Sydney Freeman, Jr.
Where is higher education as a field of study going in this century? How will higher education program leaders design and sustain their degree programs' vitality in the face of perennial challenges from inside and outside the academy? While in 1979 the Council for the Advancement of Standards in Higher Education (CAS) defined standards for student affairs master's level preparation, and while 2010 saw the adoption of guidelines for higher education administration and leadership preparation programs at the master's degree level, there still are, however, no guidelines that address higher education leadership doctoral programs, despite increasing demands for assessment and evaluation. This book suggests that higher education administration doctoral degree guidelines are a critical next step in advancing their program quality and continuity. It offers a review of the field's history, the condition of its higher education programs, developments from the student affairs specialization and its guidelines, and a multi-chapter dialogue on the benefits or disadvantages of having guidelines. At a time of urgency to prepare the next generation of higher education faculty and leaders, this book sets out the parameters for the debate about what the guidelines should cover to ensure the appropriate and effective preparation of students. It also offers a useful framework for enriching the knowledge of deans, chairs, program coordinators and faculty who are engaged in program design, assessment, and revision. It will also be of interest to policymakers, the personnel of accrediting agencies, and not least graduate students within higher education preparation programs. All the contributors to this volume have the exemplary expertise, leadership experience, and a close association with higher education guidelines and standards, and have extensively contributed to the literature on higher education. This book is published as Freeman, Sydney, Jr., Ed. ; Hagedorn, Linda Serra, Ed. ; Goodchild, Lester, Ed. ; Wright, Dianne. 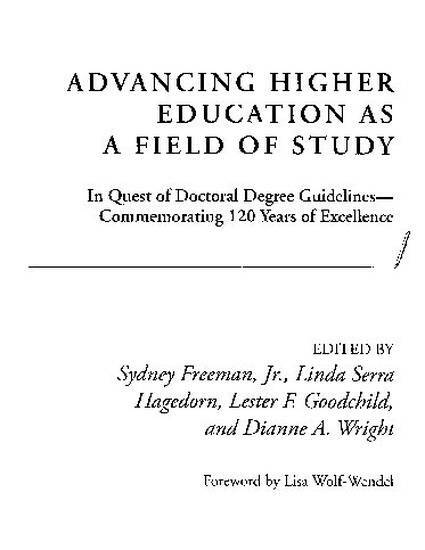 ; (2014) Advancing Higher Education as a Field of Study: In Quest of Doctoral Degree Guidelines--Commemorating 120 Years of Excellence , Ed. Stylus Publishing LLC. posted with permission.